Reman Brakes is more than just a warehouse. We are your complete automotive, medium/heavy duty and industrial parts supplier. In addition to our unmatched inventory coverage, we also provide an array of machine shop services. The services we have listed below are the most common machine shop requests. We also provide specialty services to our customers, so if you are looking for a custom service that is not listed, please contact us. 515 Ralph David Abernathy Blvd. *Please include detailed instructions (such as "don't paint the brake booster" or "match up and call with pricing") and contact information with your request. We turn drums and rotors for all applications, but in most cases recommend new rotors/drums for automotive applications due to the low replacement cost. We grind flywheels to obtain new surface. Resurface time usually one day turnaround. Price varies according to application. We will reconstruct a new steel line to match your old, rusted line; even if it has rusted into multiple pieces. The price of building custom brake lines is based on an hourly rate of $60. Time involved is based on length of brake line and number of bends. We use standard flaring on most applications making domestic brake lines, while using "bubble" flaring on most import applications. We only do flaring on steel lines (no stainless steel lines). Building of lines in usually a one day turnaround if we have the necessary line size (1/4", 3/16" or 5/16") and length in stock. Old master cylinders often have pitted cylinder walls and usually old cores cannot be found. When a master cylinder requires resleeving, it has to be bored oversize, brass sleeve pressed in and sealed, and then machined back to original equipment (OE) specifications. Resleeved master cylinder is then equipped with all new rubber parts and new spring and piston when available. Resleeving usually requires 2 week lead time. 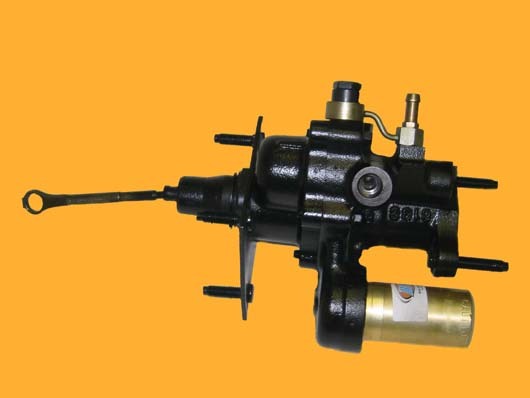 Remanufacturing brake boosters has been our bread and butter since 1956. We have rebuilt every type of brake booster unit in existence and have served as a certified warranty rebuilder for Wagner and Bendix Brakes. Rebuild time usually carries a one day turnaround (excluding pre-1962 boosters, 1 week lead time). Modification is involved when customers desire smaller or larger vacuum boosters or if they simply need more power. We can switch out your existing unit with a smaller/larger unit and interchange master cylinder, switch out pedal rods, or even change stud locations to accommodate for new vacuum booster setup. Booster modification usually requires one day turnaround but can vary based on setup. We can remanufacture your old starter and/or alternator if we do not have one on the shelf. Our rebuilder has been remanufacturing starters and alternators since 1976. Rebuild time usually carries a one day turnaround.